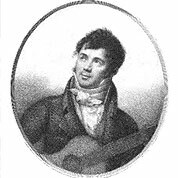 Fernando Sor was a Spanish classical guitarist and composer. He is best known for his guitar compositions, but he also composed music for opera and ballet, earning acclaim for his ballet titled Cendrillon. Sor’s works for guitar range from pieces for advanced players, such as Variations on a Theme of Mozart, to beginner pieces. Opera was the staple of the Parisian musical diet in the first half of the 19th century. In fact, Opera was the dominating force of nearly all aspects of Parisian musical cultures. Of course, in the 19th century, practically the only way to bring concert music, including operatic music, into one’s own home was through arrangements for household instruments such as the guitar. In Six Airs from Mozart’s The Magical Flute, Sor prepares a few highlights from the opera. Here, a consumer could experience the grandeur of large scale work by a great master, but reduced to a manageable proportions. Although such arrangements were often conceived primarily as money-makers for publishing houses, the Airs are quite deserving of the concert stage. The 3rd and fourth movements contains numerous harmonics. Since harmonics tend to sound with a much more subdue tone (especially those produced above the 3 and 4 frets), strike these with more force; likewise, bring down the volume of the fretted notes in these passages so that the dynamic level remains consistent. Be sure to compare the fourth movement , “O dolce harmonia” to Sor Opus 9 Variations on Mozarts Magic Flute Theme. Both are based on exactly the same music, but the Variations are much more technically brillant while Airs remain more true to the music of Mozarts Opera. Classical Era. 28 Measures. 3 Pages. Time Signature 4/4. Key of C. 2 Parts. Repeat Both Parts. Classical Era. 33 Measures. 3 Pages. Andante. Walking Pace. Time Signature 2/4. Key of G. Natural Harmonics.